Twelve days after he died most unexpectedly in the course of what should probably have been a routine operation the remains of Sam Frobisher Owori president-elect of Rotary International and most a accomplished banker, will arrive home today from the United States. The aircraft carrying Owori’s coffin is expected to land at Entebbe International Airport at 12.00 (mid-night). Initially, the body was supposed to arrive at 3 pm, but the flight was rescheduled due to technical problems. When he left the country only weeks ago, it was hoped that the surgical operation on his leg at a Dallas, Texas hospital would be without incident. But on July 13, he developed post-surgery complications and left this world. In recognition of his dedicated service to humanity, and in painful memory of his tragic passing, Rotary clubs worldwide will fly their flags at half-mast for the next week. 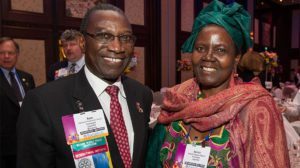 Owori,76, was going to be only the second African to lead Rotary International and the 108th president in the history of this globally acclaimed organisation. His installation had been slated for July next year in Toronto, Canada. That will not come to pass now. 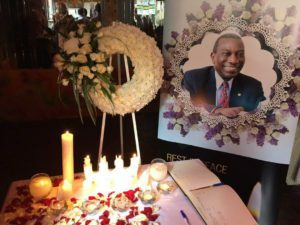 Mourners pay tribute to Sam Owori, the Rotary International president-elect at Grand Imperial Hotel in Kampala today. Courtesy photo. He will still be remembered for his diligent service to humanity with Rotary Club of Kampala where he served for 38 years. Under his leadership, the number of Rotary clubs in Uganda grew from nine to 89 over a period of 29 years. As they prepare to lay him to rest, Rotarians will remember Owori for his quiet confidence, integrity, friendship and his delightful smile. Last Thursday, July 20, the past district governor of 9211, Stephen Mwanje announced the Sam F. Owori Memorial Fund in memory of the fallen Rotarian. This fund recognises the efforts of the now-deceased leader’s in polio eradication, itself one of Rotary’s major causes. “The ‘End polio’ campaigns we have gotten involved in were all Sam’s ideas,” he said. Mwanje also announced the burial arrangements for a man he said offered incredible service. A memorial service to celebrate what is being described as a “life well lived” will be conducted on July 27 at Namirembe Cathedral in Kampala. On the same day, another service will be held on the evening of the same day at St Peter’s Cathedreal in Tororo. Two days later, on July 29, the body of Owori will be laid to rest at his ancestral home in Nagongera, Kidera, Tororo District. Sam Owori (left) with Hilda Tadria, a member of Rotary Club of Ggaba during the happier times. Courtesy photo. He is survived by a wife, Norah Agnes Owori; three children and three grandchildren. PML Daily has received confirmation that the Vice President of Rotary International, Hendreen Dean Rohrs will attend the funeral. 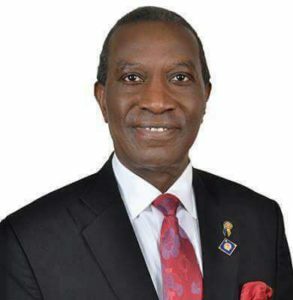 Before election as Rotary International president-elect, Samuel Frobisher Owori was Chief Executive of the Institute for Corporate Governance of Uganda. Previously, he was Executive Director of African Development Bank; Managing Director, Uganda Commercial Bank and Director of Uganda Development Bank. He also served as a Corporate Secretary, Bank of Uganda. He was a member and chair of several boards including FAULU (U) LTD which is now Opportunity Uganda, The Uganda Heart Institute, Centre for African Family Studies, Mulago Hospital Complex, Mukono Theological College and the Kampala City Council.